Comfortable kimono made from flowing viscose knit fabric, with a midsummer printed pattern that makes you want to visit the sea. The summery light material, bright colours and traditional kimono elements make this creation by Blutsgeschwister an especial favourite. The feel-good element is thanks to the patch pockets, a sash at the waist and ¾-length sleeves with a forearm slit. The comfort resulting from its cut and fabric makes this Asian must-have a suitable everyday item that makes a fashion statement. 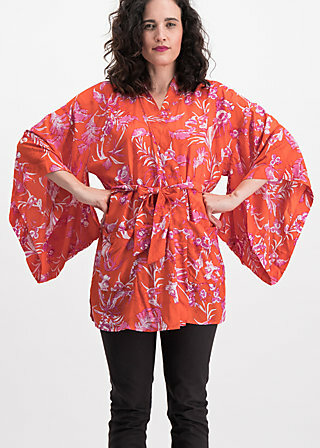 When worn open, the classic kimono also acts as a casual caftan, which you can put on anytime, anywhere - uncomplicated and with plenty of freedom of movement. The fabric “tangerine-tropical” can be easily combined with those fabrics.